In the space of six weeks during the winter of 1918/19, whilst living in Switzerland, Nijinsky wrote his 'diaries'. These are a rather rambling 'stream of consciousness', with no dates, strongly influenced by the later writings of Tolstoy, especially his book 'The Kingdom of God is Within You'. Nijinsky was far from alone in this as there were many 'Tolstoyans' including Gandhi, who named his South African ashram 'Tolstoy Farm'. p.18: Medicine is useful only as a help, but it is only Nature which can give and restore health. Tolstoy did not like medicine either. p.21: I cannot force my wife to become a vegetarian. She eats meat because she loves it. p.29: The Spaniards spill the blood of bulls and therefore like murder. They are terrible people because they murder bulls. Even the Church and the Pope cannot put an end to this slaughter. The Spaniards think that a bull is a beast. The toreador weeps before killing the bull. I know that many toreadors whose stomachs the bull has split. I hated this slaughter but I was not understood. 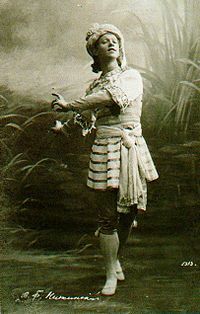 Diaghilev said with Z. [Diaghilev's friend] that a bullfight is a magnificent art. I know they will both say I am mad and one cannot be offended with me, because Diaghilev always used that trick. p70: I do not like eating meat because I have seen lambs and pigs killed. I saw and felt their pain. They felt the approaching death, I left in order not to see their death. I could not bear it I cried like a child. I ran up a hill and could not breathe, I felt that I was choking. I felt the death of the lamb. I chose a mountain, where there were no people. I was afraid of being ridiculed. p.73: I was called to lunch at half past twelve. I wanted to eat. I did not lunch as I saw meat. My wife wanted to eat it. I left the soup, which was made out of meat, my wife became angry. She thought I disliked the food. I dislike meat because I know how the animals are killed and how they cry. I wanted to show her that marriage is non-existent if people are of different opinions. I threw the wedding ring on the table, then took it and put it on again. My wife was terribly nervous. I threw the ring once more, because I felt that she was wanting meat. I love animals and could not therefore eat their flesh, knowing that if I did, another animal would have to be killed. I only eat when I am hungry. My wife is sorry for me and thinks that I must eat. I like bread and butter and cheese and eggs. I eat very little for my constitution, and I feel better since I have not eaten meat. I know that doctors will say all this is nonsense - that meat is necessary. But it is not: it arouses lecherous feelings. Those feelings have disappeared since I have not eaten meat. p.74: Since I gave up meat I feel better. My thoughts are clearer and I run instead of walking. […] I am a vegetarian. My wife feels that one should not eat meat, but she is afraid to give it up. She thinks that doctors know more about it than I. [....] I want to help her and therefore did not want her to eat meat. p.87: Many people misunderstood Tolstoy. He was not an Anarchist. I read his works many times. I see that he loved everybody. He loved God and not a [political] party. I also do the same. p.133: The earth will also be like Mars but in a few hundred years hence. The earth is suffocating, therefore I am asking everybody to abandon factories and listen to me. I know this is necessary for the salvation of the earth.